Anything with bacon seems to draw my attention, so I immediately wanted to make this when I saw it in Food Network Magazine. 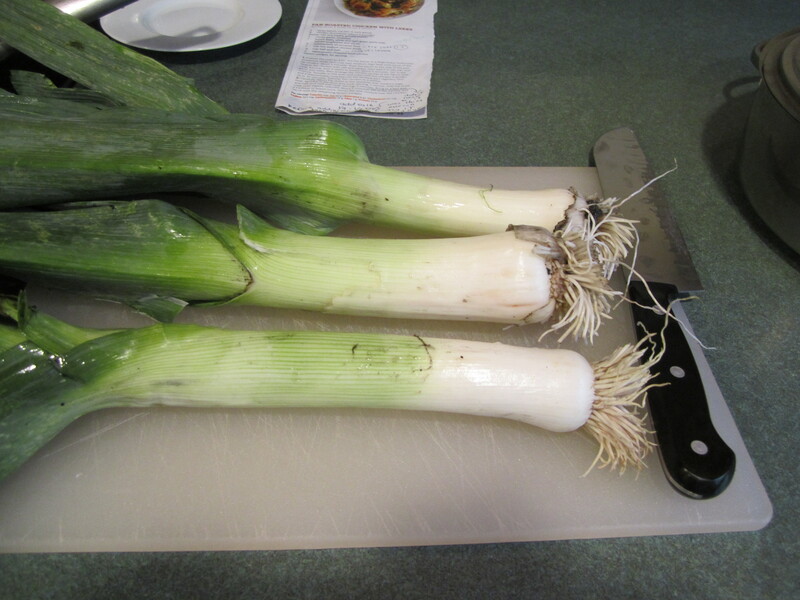 And leeks are such a great food: milder than onions (my Mom used them instead of onions often because onions bothered her) but still providing that onion flavor. A little more expensive but definitely worth it. Preheat the oven to 425 degrees. 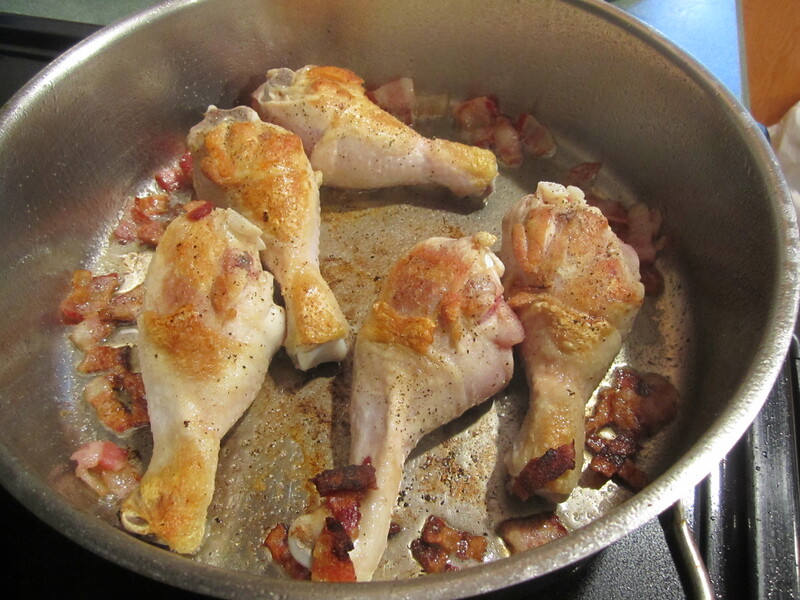 Put the bacon in a large heavy bottomed OVENPROOF skillet and cook over medium high heat until most of the fat renders (the fat is melted from the bacon, thus giving you something to brown the chicken in rather than using olive oil. 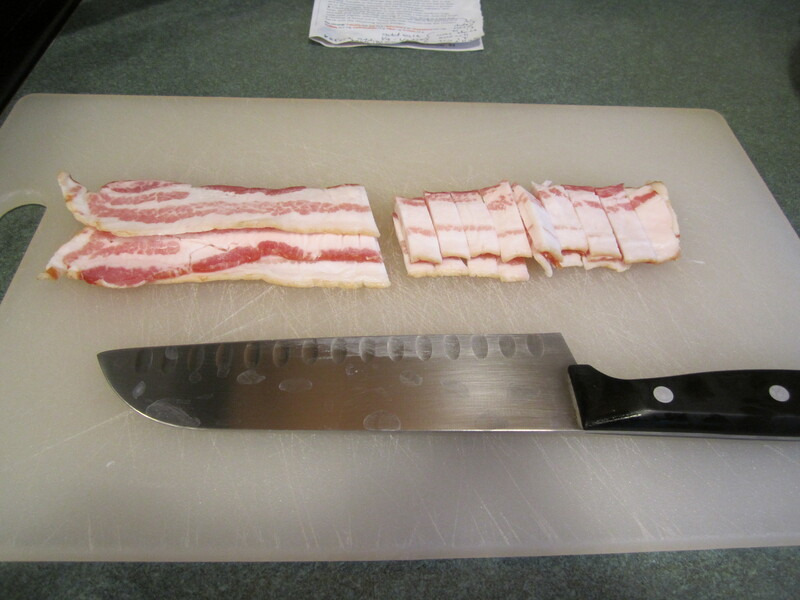 This enhances the overall bacon flavor: yum!) about 5 minutes. 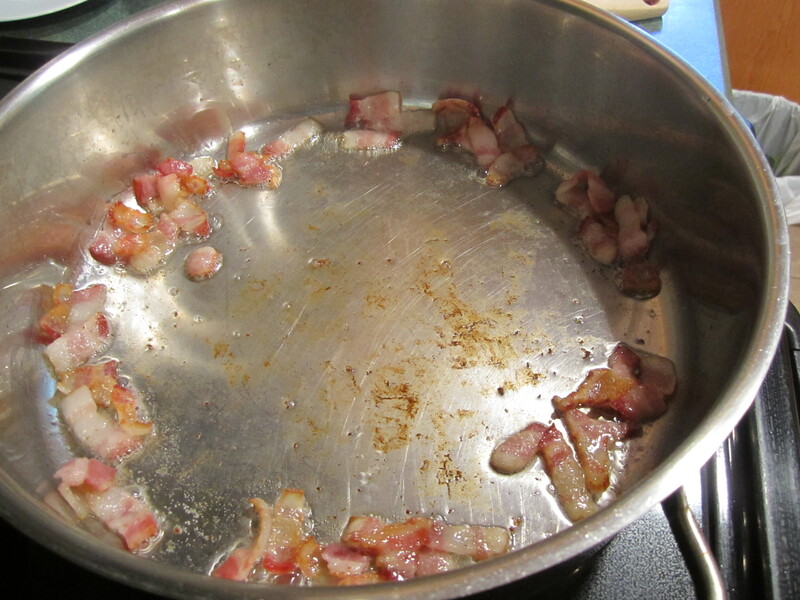 Push the bacon to the sides of the pan. 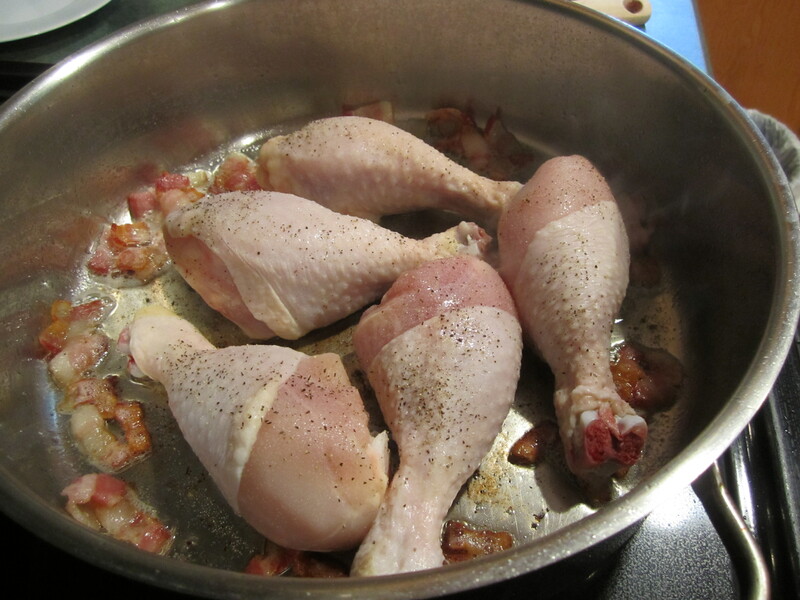 Add the chicken drumsticks, salt and pepper the one side, and brown the chicken pieces, for about 4 minutes. 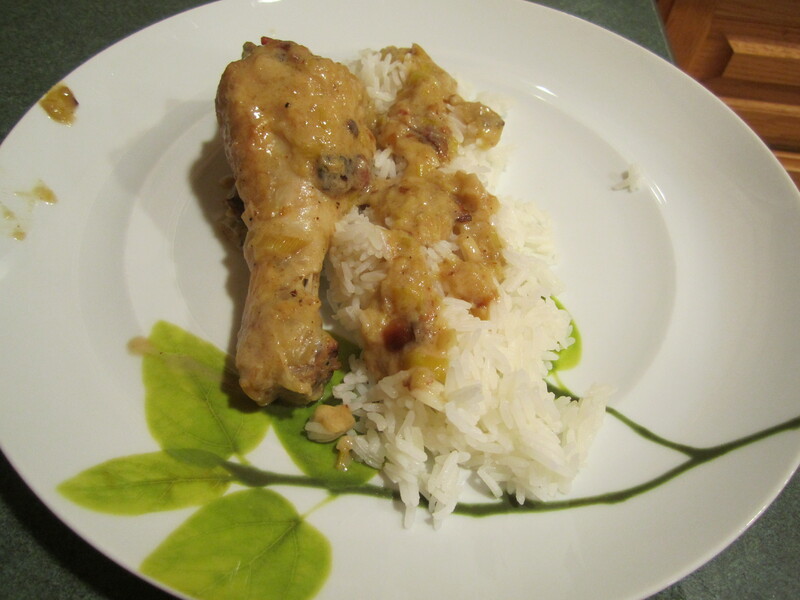 Turn chicken drumsticks. Salt and pepper this side and brown for about 4 minutes. 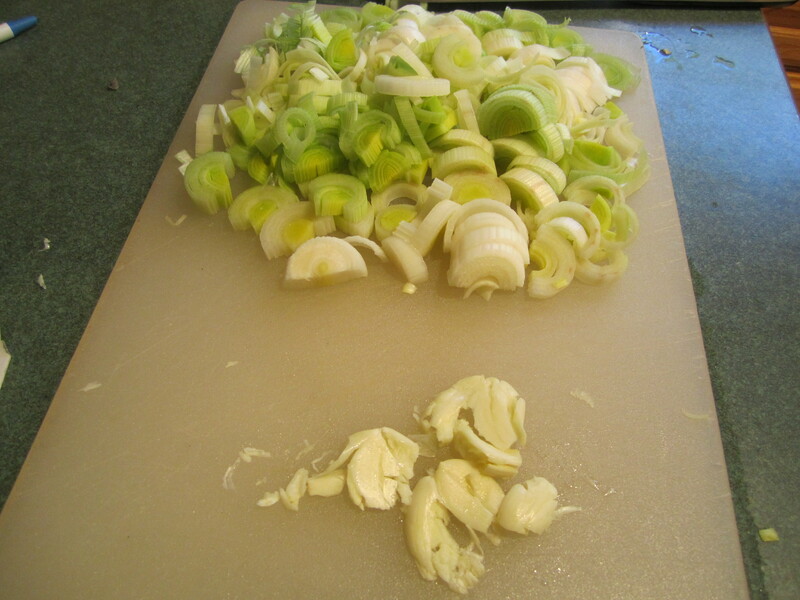 Remove the chicken and set aside on a plate. 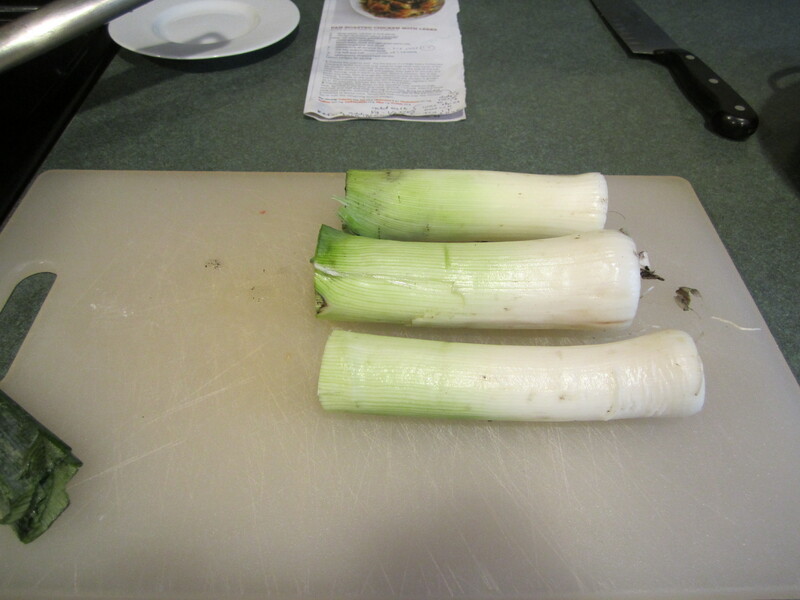 Add the leeks and smashed garlic. 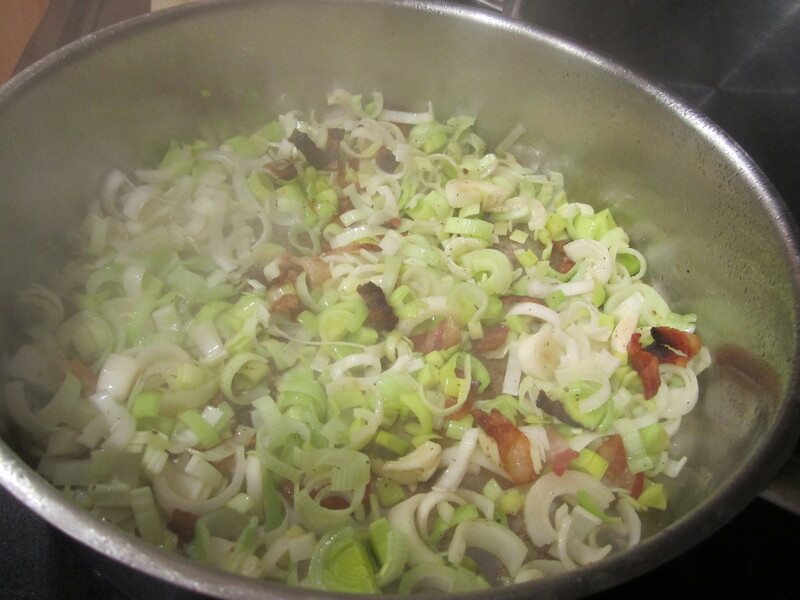 Stir together with the bacon. 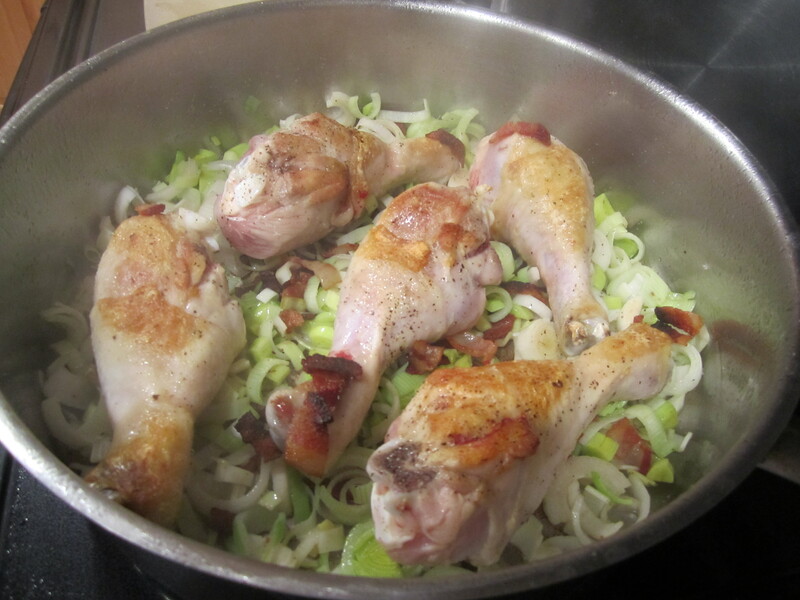 Add the chicken back in, on top of the bacon, leek and garlic mixture. Transfer to the oven and roast for about 45 minutes or until a thermometer inserted into the thickest part registers 160 degrees. 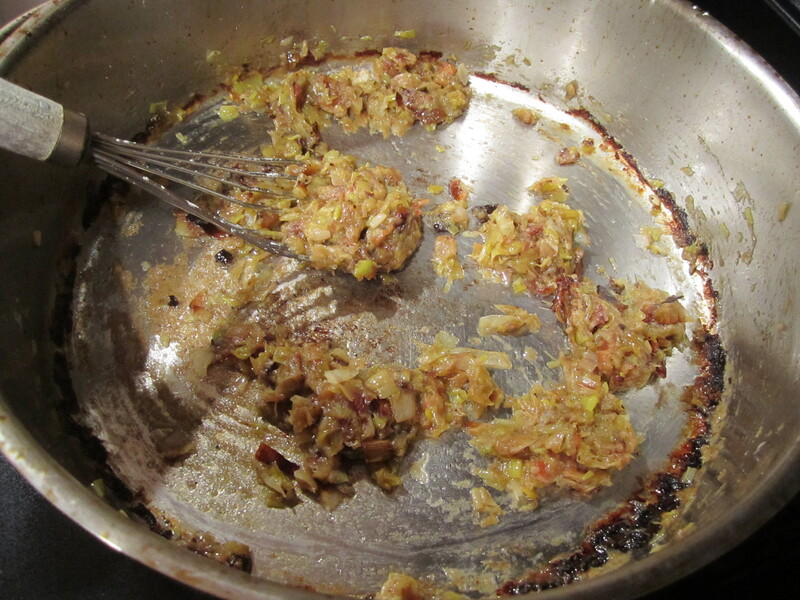 Using your POTHOLDER (I cannot tell you how many times I have tried to remove my saucepan from the oven without one: ouch, ouch, ouch!! 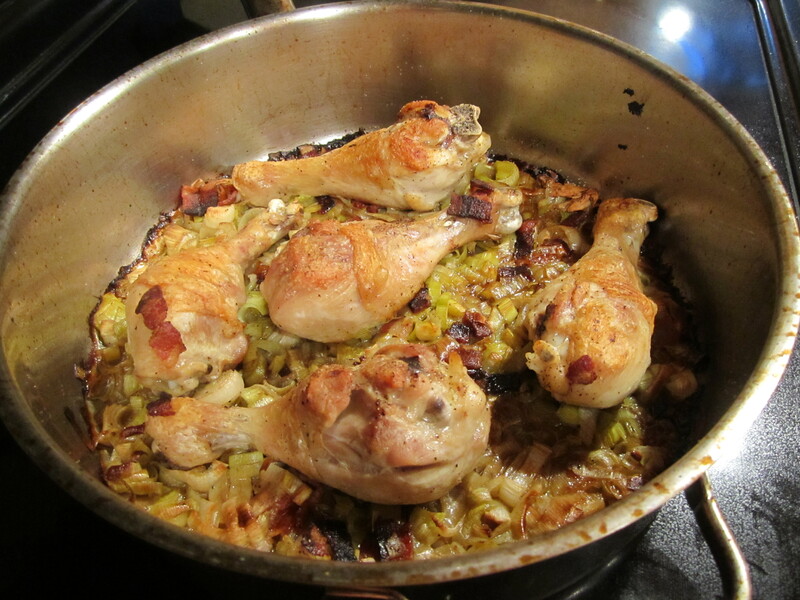 I know it’s stupid and maybe you have NEVER done this before but I had to warn you) remove pan from oven and transfer the chicken to a platter. 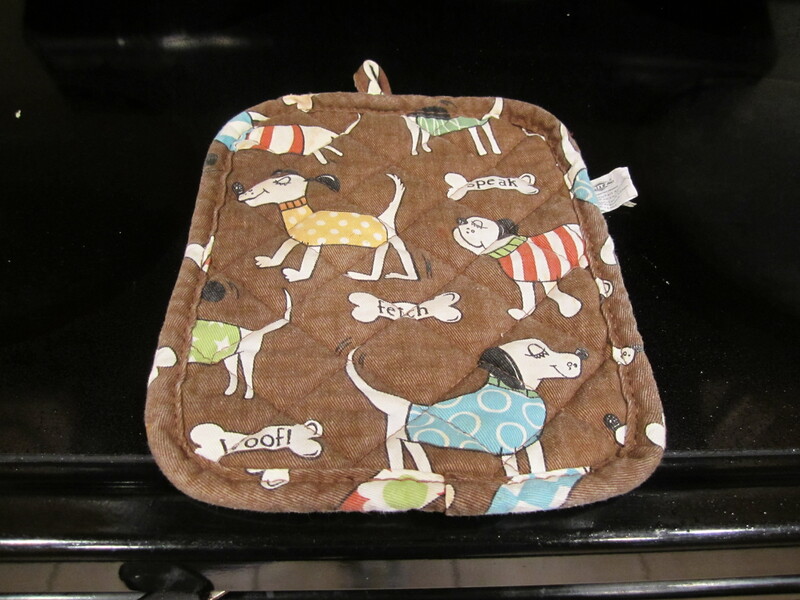 Using your POTHOLDER, place saucepan on stove top over medium high heat. Sprinkle in the flour and cook, stirring constantly for 1 minute. 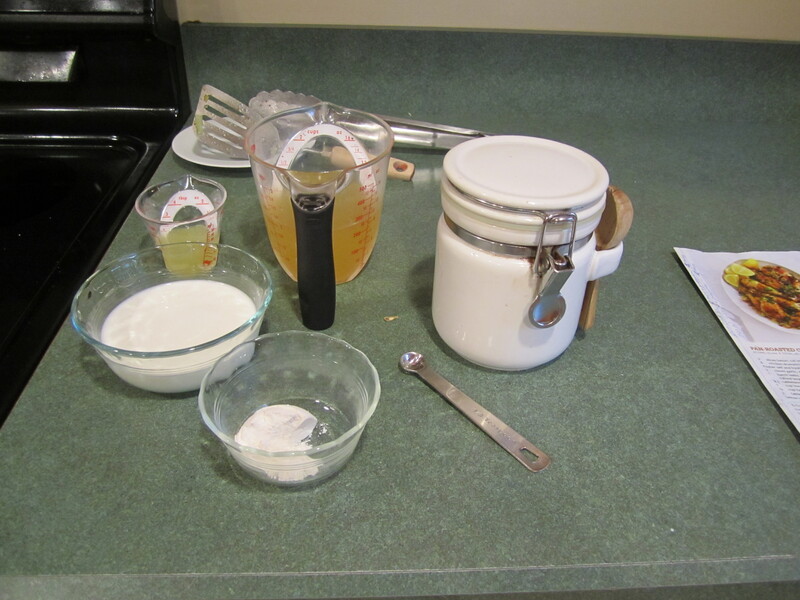 I use a flat whisk, very helpful in this application. 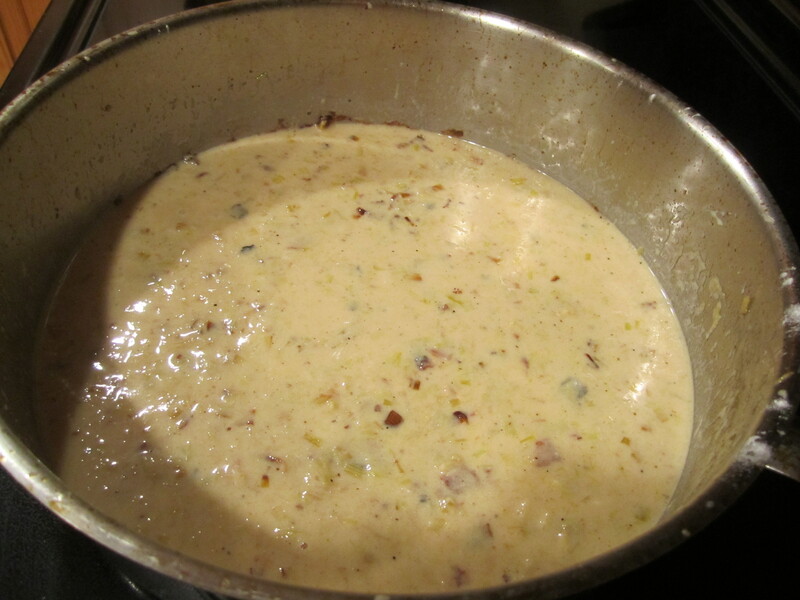 Add the chicken broth, half and half and cook stirring for about 2 minutes, scraping up any browned bits left in the pan. Add lemon juice. Taste for flavor: I added an additional 1/4 to 1/2 teaspoon of salt. 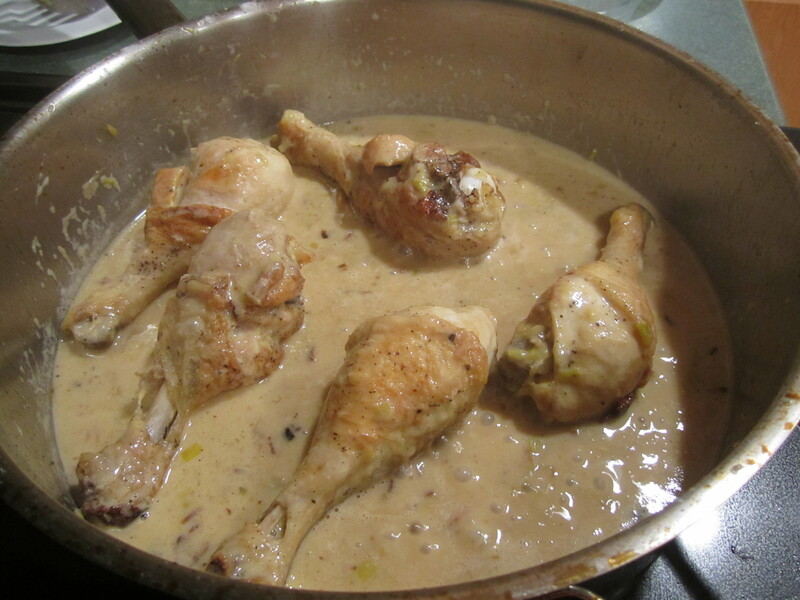 Return chicken to saucepan, spooning sauce over chicken. Serve immediately. 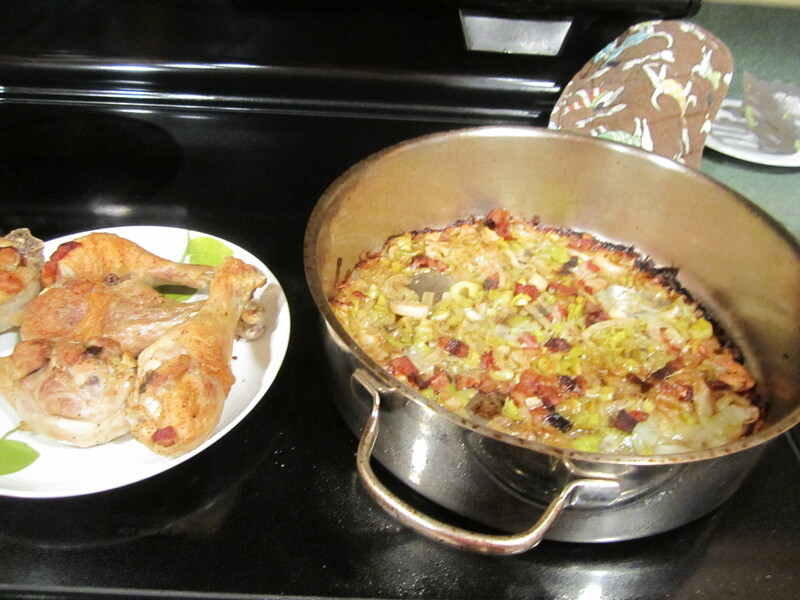 I served it with rice but certainly mashed potatoes or noodles would also work very well.